Recently, Google introduced a Suggested Edits feature in Google Docs which essentially allows peer editors to change modes when editing content so suggestions become a Comment for the author to review. 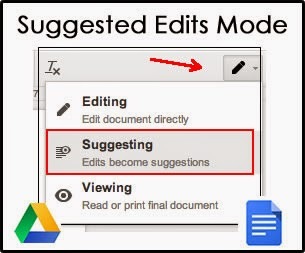 When authors Share a document with Comments Only rights, this switches the editing mode to the new Suggested Edits. If an author accepts a collaborator’s suggestion, the comment automatically disappears. The feature is available in the Desktop Version of Google Docs, as well as the iPad app. 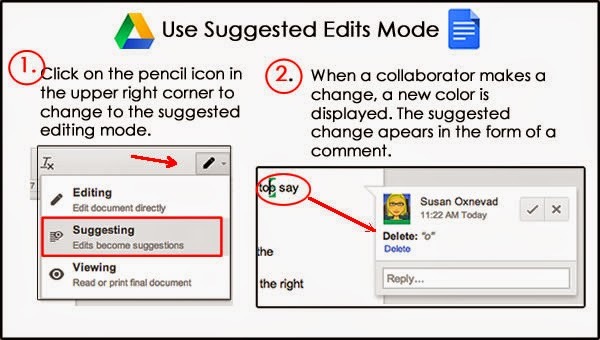 I have been using Google Docs for writing instruction for many years now and I have always required students to use Comments and the Revision History to achieve the same results, so the automated process comes as good news to me! This feature and more automated functionality will most likely be unveiled with the Google Classroom, expected to roll out just in time for school to begin, providing the Google Team works 24/7 to make it happen. I only had a quick tour of the new Google Classroom at ISTE, but it does appears as though much of the functionality teachers need has been considered. The Google Classroom adds a level of control through a familiar online classroom interface which allows teachers to set due dates, organize student work and add students to specific classes. Perhaps the best feature I noticed was providing teachers with more control over those student documents. Now, when students turn in a document, they no longer have editing rights. Teachers can assess the work and return it to students which returns their editing privileges. Based on common feedback I receive from teachers in our work together, I do believe this will be a feature that teachers appreciate.